"...1. 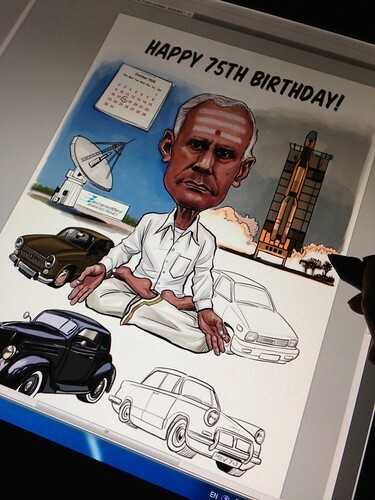 Caricature Details for my Dad's 75th Birthday. c. I have provided pictures of my Dad, they are not very sharp and are of low resolution as I had to crop them from group pictures. d. What the artist needs to remember is that he has to wear a white full sleeve shirt and the white Dhoti (white sarong) with the golden border ( in the pictures please ignore the bags and the lanyard + camera etc - please do NOT include those). 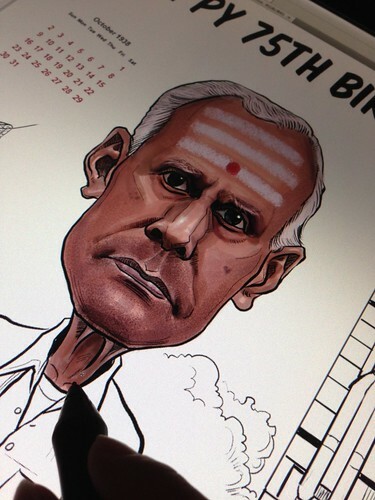 Also to remember - there should be 3 thick white lines on his forehead ( each white line should be proportionately as thick as his index finger, with the red big dot in the center of the bottom white line (this is the religious white ash and red kumkum). This dot should be proportionately as big as the tip of his middle finger. e. He loves his cars - so I have provided them - his first car is the pic called old car, I do not remember the car number, second one was the white herald and its number was MEV 713, His next car was the Fiat - please use a brown color that is shown in the car seat picture - he had a brown fiat and the number was MET 3737. His current car is the Maruthi white colour - I do not know the Car Number. 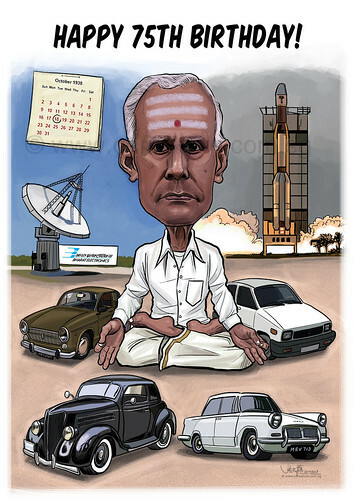 f. His profession - he is an engineer and throughout his career he worked on building Radars for the Indian Space Research Organization ( ISRO) - for launch of their rockets - this was his passion and even today he talks proudly of this. So I have pictures of Radars and a picture of a rocker launch from ISRO. g. He worked his entire career in one company called Bharat Electronics Limited - I have provided you with the logo of this company. h. I have also provided the Calendar for the month of Oct 18th 1938 ( my dad's birthday), it was a Tuesday that he was born. I. 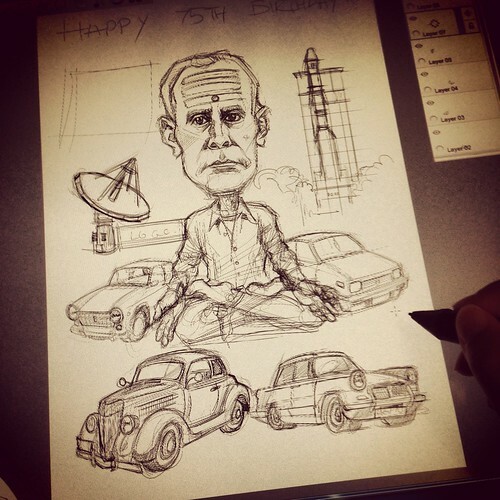 Will be great if you can have a Birthday wish as a title on the A3 paper - saying "Happy 75th Birthday"....."
The client wanted many items and in A3 size. I proposed to draw it digitally to get the details out. 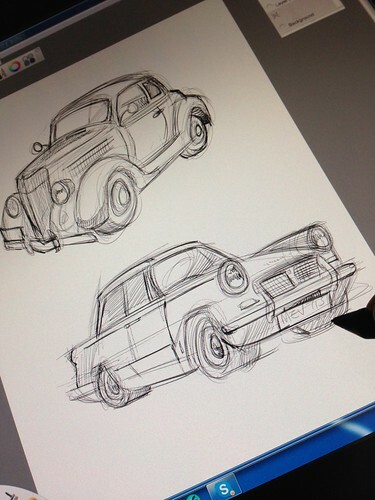 The sketch alone takes a lot longer than usual. I don't have a close skin colour for him if I use my colour markers. No such issue when I paint digitally as I have millions of colours I can choose from. I added more details to the face, especially his complexion. Not possible if I do it with colour markers. 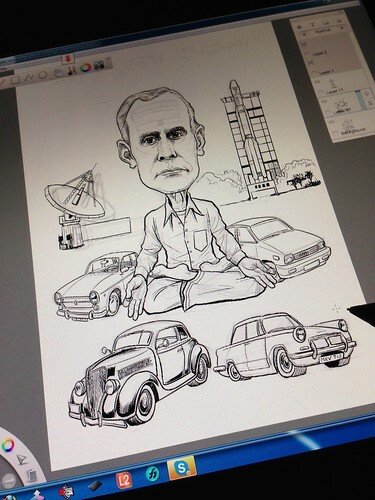 Looks like this is the way to go for the future caricature drawing?! The painting takes the longest, but the outcome is satisfying!